Connecticut 1990 Orthophotography is a statewide aerial survey of Connecticut based on 1990 USGS 3.75 Minute Digital Orthophoto Quarter Quadrangles (DOQQs), which are orthophotos that cover one quarter the area of a USGS 7.5 minute topographic quadrangle map. The photographs are black and white and taken under clear sky conditions when deciduous trees and shrubs are in leafless condition ("leaf off") and the ground is free from ice, snow, cloud shadows, and floodwaters. This type of black and white, leaf-off photography is captured during the early spring immediately after snow cover melts and before stream levels rise and leaves blossom. The ground resolution for this imagery is 3.28 feet (1 meter) per image pixel. Orthophotography combines the image characteristics of a photograph with the geometric qualities of a map. Orthophotographs have been geometrically corrected, or "orthorectified" so that the scale is uniform and distortion is minimal. Thus, orthophotographs can be used to measure distance because they have been adjusted for topographic relief, lens distortion and camera tilt. Orthophotographs can serve a variety of purposes, from functioning as a cartographic base to supporting identification and mapping of habitat areas by interpreting the aerial photography. This particular aerial survey is ideal for observing features on the ground surface in developed, open or wooded areas because leaves on trees and shrubs that normally obstruct the view from above are largely absent. For example, features such as stone walls, roads, and structures in wooded areas may be observed. It is useful to display orthophotography for viewing soils, geologic, hydrologic, and other natural resource information. The shade-of-gray nature of black and white aerial photography make it an ideal backdrop for more colorfully shaded information such as wetland soils, for example. Note, DOQQ hard copy prints of the Connecticut 1990 Orthophotography at 1:12,000 scale served as the photo base for compiling the soil map unit boundaries of the Soil Survey Geographic (SSURGO) database for Connecticut. 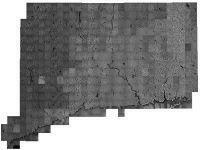 This statewide mosaic of 1990 orthophotography is not color balanced so tonal imbalances between individual input images are not corrected. As shown in the example above, some areas are darker than others. Also, the location and shape of features in other GIS data may not exactly match information shown in the 1990 aerial photography primarily due to differences in spatial accuracy and data collection dates. For example, a stream in the 1:24,000-scale Connecticut Hydrography data from CT DEP may not line up exactly with the watercourse shown in the 1990 aerial photography. Date of Data - Spring 1990. Map Scale and Accuracy - 1:12,000 scale (1 inch = 1,000 feet). The ground resolution for this imagery is 3.28 feet (1 meter) per image pixel. GIS Metadata - Contains technical documentation describing the 1990 Orthophotography data and the data sources, process steps, and standards used to collect and store this information in a geographic information system (GIS). 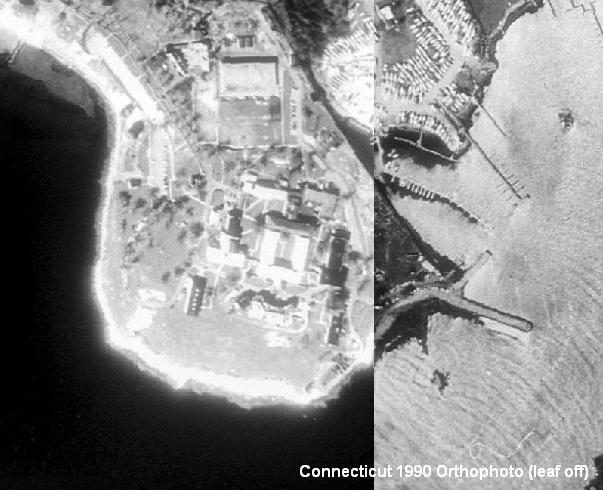 Connecticut 1990 Orthophotography data is available as a statewide mosaic in File Geodatabase format from DEEP GIS Data. Connect GIS and AutoCAD software to this information online using the Ortho 1990 CT ECO Map Service.